The exact roadmap to Scottish independence is not clear. Indeed, there are different views in the movement about tactics, timing and method. These debates will continue. But as they do the independence movement continues to show its strength, as recent demonstrations show. The crisis engulfing the British state is not going to end any time soon. This means we must be ready for all eventualities. We must make sure we are geared up. That in the here and now we are developing activism, ideas and inspiration to sustain and grow the movement. 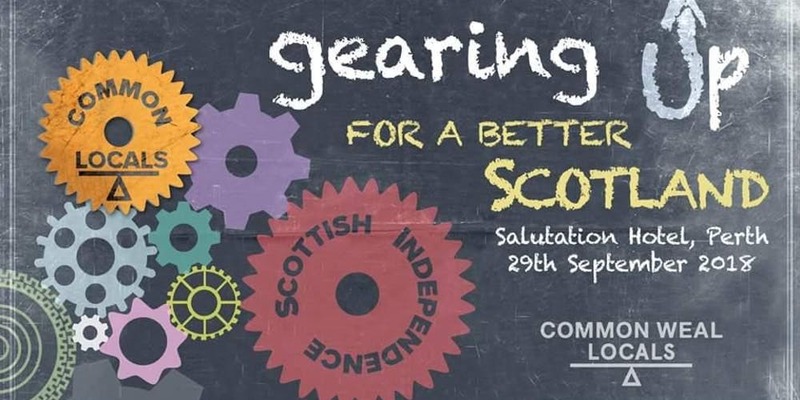 That is why the Common Weal local groups have come together to organise a day event that will consist of both political discussion on strategy as well as developing campaigning skills. These local groups are part and parcel of their community, and are a vital on the ground resource. We are gearing up for what is to come – and we want you to be part of it. Every part of the independence movement has an important role to play. But perhaps what made the referendum so inspiring was that party, no organisation, no one individual was in charge. Instead we saw a movement arise without being phased by the scale of the opposition, nor being cowed by the parameters of formal politics. Without asking permission from anyone, ordinary Scots awoke, organised and almost made history against all the odds. “Gearing Up: For A Better Scotland” takes place in that spirit. We aim to ensure that no matter your experience, that you will leave better equipped to campaign for an independence that can change the lives of millions of people for the better. Everyone will have the chance to feed in their ideas too. The great strength of any movement is its ability to debate, learn from mistakes and to be honest too about how changes in the political environment might affect its development. In this vein, the discussion wont be aimless – but productive and positive. We have worked hard to design a programme that will maximise your input, and learning. We want to reflect on your experiences. At the same time we also know that Common Weal has a bank of knowledge to impart. Dr Craig Dalzell will take us through key policy proposals and how they can connect with your campaigning. Craig is well known to many of you, having become involved during the referendum, and we are delighted that he will be on hand to field questions with his ability for breaking down complex ideas into digestable chunks. Perhaps you have ideas about areas you think we could explore in relation to our policy development? We would be delighted to hear them. Many of us are on social media. But are we making the most of it? How can we make social media a place where we can promote our ideas effectively, or carry out debates more amicably? Sarah Mackie will take us through the key elements of creating a successful social media campaign. There is so much to learn here, and you will see that after the session you will be able to relate to Twitter and Facebook in a more refined and impactful way – and that will help serve the movement as a whole. Robin McAlpine will provide an over view of the general political situation. Everything we do must start from having a discussion about the context in which we are operating. From here we can work out the best interventions and strategies. Again – we want to hear from you about what you think the key issues are. Let’s tackle the challenges directly. These interactive sessions will balance debates on the big political questions we face with practical guides for action. Education is a key part of our work too. So if you have questions about our currency proposals, for example, this is the place to find out more. Or maybe you have a skill set that could be passed on to others. We can help you to connect with our local groups. Lastly, while most young Scots support independence, that independence events often seems to lack youth involvement. So we have a dedicated session based on recruiting young people to become activists for independence, Common Weal and the range of progressive causes in Scotland. If you got involved as a teenager in 2014 and are looking to put your energies into something that can positively change Scotland – this is the place for you. The whole Common Weal team will be there. This is your chance to suggest campaigns we might run, or to find out how you can get involved. This is your movement, and combined with the ideas that Common Weal have been developing over the last 4 years – we have a powerful message to advocate, and the organisation to get the word out. We are gearing up. Join us on September 29th in Perth and be part of a special day. It will be another vital contribution on the road independent Scotland that puts people first. All the details on Gearing Up are here. This is really important but very short notice (unless I missed something..) . I hope that it can be repeated in at least a couple of other locations give more folk/groups the chance to participate and contribute. Yes would like to get involved with this, but transport from Glasgow on the day is a bit difficult. Really hope there are additional meetings in different locations.